The trend in deck building or deck remodeling is to move away from functional space to entertaining areas. For years, we saw home builders and contractors as well as home owners come to Brunsell in search of decking that would expand their home. Now, we are seeing even more people looking at their backyards and wondering how they can spend more time there comfortably, extending their home for more outdoor activity in the warmer months. 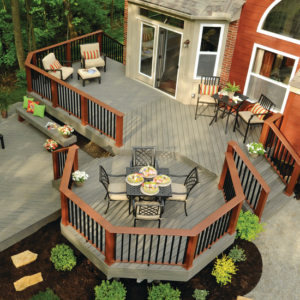 Here are just a few of the ways to do that with your deck! The old 20 x 10 deck standard to fit your few chairs and grill is gone. Multi-level decks that include built-in seating, storage and even “rooms” are in; rooms actually means walls are being added to separate areas on the deck! This is about making the space and adding to the function of that space while making it more inviting. Grilling on the deck during the summer used to mean walking in and out from the kitchen to the deck; back and forth with all the stuff needed. It was a hassle and sometimes led to overcooked steak. No one wants that! Adding countertop space, even a sink and faucet and, of course a little fridge and even stovetops is the trend now. For some remodelers, rather than adding a new room to the house, they are spending the money to add kitchens and living rooms outdoors. Americans are spending 30% more time outdoors than they did before. Why not spend it on the deck all day? We have talked about pergola before and this is a good time to talk about them again. When changing the look of the deck, consider the sun and where it is all day long. Why not find a way to add shade to the remodeling project? Pergola are great additions and an easy way to bring the shade. The ceiling of a pergola is always left open but you can add protection that can be removed fairly easy. We are ready to help you with your deck; whether it’s new or remodeling, we have plenty of options including the newer trend in composite and PVC decking. We can also help you design a deck! Give us a call to schedule a time to chat or come in and talk with one of our representatives! This entry was posted in Decking and tagged Custom Decks, Decks, Decks Madison, outdoor kitchen, Outdoor Living Space. Bookmark the permalink.